[New for 2017] I've already seen a couple of our instagram buddies posting similar photos, but now it's my turn to unveil the new Breyers Delights line up that should be hitting your local freezer soon (Probably at $4.99 a pint). Unfortunately I won't be reviewing any of them because, like Halo Top and Enlightened, they are made with erythritol (and technically a little bit of Stevia). There will be four flavors to start. Cookies & Cream, Vanilla Bean, Mint Chip, and Creamy Chocolate. As others have commented, there is quite a bit of similarity between their pint design and that of Halo Top. The biggest difference is that they have four flavors and Halo Top has about 73 (just kidding, but it's a lot). To clarify though, it's not a bad looking pint, but I've always liked Breyers black based containers. 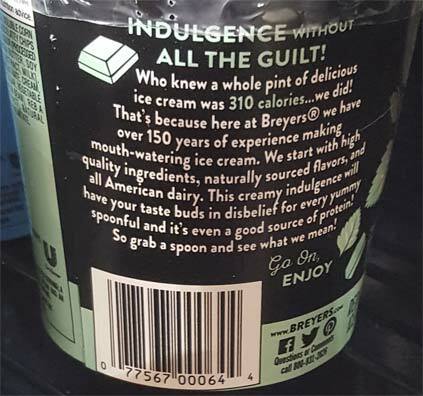 What is it with Unilever and their browbeating of making ice cream seem guilty. This is about them making money, not about you feeling better about yourself. There's nothing wrong with eating ice cream. Plain and simple. Just moderate your intake, that's all. Either have a bunch of the regular stuff or a smaller amount of the super premium stuff. Out of curiosity, does everyone remember the blue Breyer's Smooth & Dreamy line up? They had Jane Krakowski as the spokesperson and to be honest, the whole campaign drove me nuts. Speaking of simple, I have seen worse labels, though it's funny to see Stevia called Reb A. 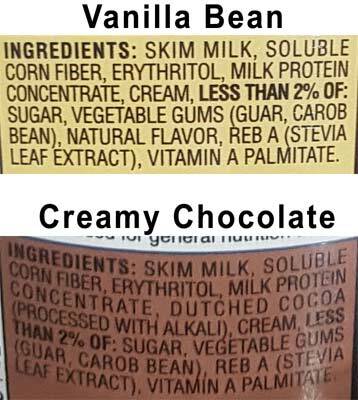 Granted there are no mix-ins for these two flavors and the other two flavors do have longer ingredient lists, but there's nothing terribly scary here except my penchant for not being able to handle erythritol (I couldn't even make it through my Enlightened samples). So, are you excited that Halo Top and Enlightened have competition from a monster player like Unilever. It sure does seem like they are trying to get in to every single market variation right now. I want to say this will fail hard, but we still have Breyers "gelatos" floating around. October Update: Three more flavors have been added to the line up. Vanilla Cupcake, Butter Pecan, and Raspberry Fudge Swirl should be hitting your local freezer aisle soon. I praise Breyers for increasing the competition to Halo Top, Enlightened, and Arctic Zero. People want to eat a lot of ice cream without feeling guilty and without packing on the calories and pounds; but, Halo Top, Enlightened, and Arctic Zero are expensive. If Breyers can keep their costs lower, then they will win the battle. 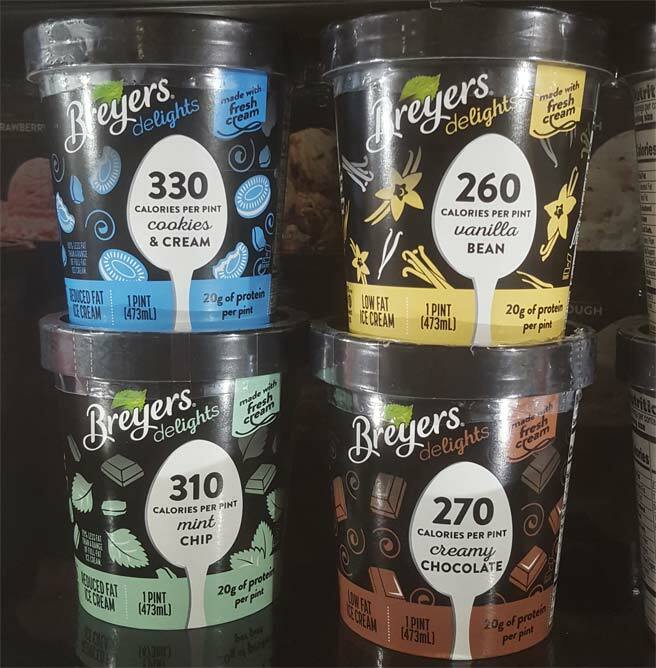 I, for one, cannot afford these expensive 'healthy ice creams', but I would love to have them, so if Breyers can actually make it affordable, then I will certainly be buying from them and often. If not, then their efforts will have been wasted as they will bring nothing new to the table. I hope that this is the beginning of the competition, as I would love to see the other big boys, namely Ben and Jerry's and Edy's, get on board and increase the competition even further with their lines of 'healthy' ice cream. The downside to this is the amount of increasing shelf space these items are getting are opposed to standard ice cream. Iunno, I thought Enlightened's Oatmeal Caramel Cookie Crunch was fantastic for the macros and the best of its kind. I do agree about the shelf space issue though. Whats your issue with Erythiol, Dubba? I' with stride4...excited to try this! Enlightened Cookie Dough is amazing! It's honestly super nice to be able to get a whole pint of ice cream multiple times a week without guilt or weight gain. I get that they aren't for everybody, but its nice to have the option. My body can't handle the fat content of normal ice cream which hard as a life long ice cream fan. Light ice creams makes ice cream an every day food as opposed to a special treat. Obviously, I'll have to track it down to try though. I thought we were finally over this saturated fat is bad for you fiasco. Im actually more worried about all the artificial ingredients, fillers, and sugar alcohols than I am of a solid ice cream with just milk, cream, eggs, sugar, and flavor. Agree that this will have a real shot if they keep prices down. Halo Top & co. are great but who can afford them? Kroger has also launched Simple Truth "Low Cow" ice creams that seem closest to enlightened in formula but more aimed at competing with Halo Top. There are no Krogers in my region, but I give them props for best punny name that most people won't appreciate. Funny, I didn't realize that the price of halo top was such a sticking point. Interesting! It's funny how varied the price of Halo Top can be. Luckily I have become accustomed to the fake sugars in these ice creams & have no issues anymore. Around my area Giant was the first to carry Halo Top & usually prices it around $5.99-$6.99 a pint. I've found it at Wal-Mart for $4.64 so of course I'll pay that price over Giant's when I feel like I want to inhale a whole pint. Weis usually prices Enlightened around $3.99-$4.99 & have more flavors (some newer ones) than Giant. What makes me extremely jealous is people have said Shop Rite prices Halo Top & Enlightened during sales for $2.88. didn't even see it on junkbanter. Unfortunately the family can't compare to enlightened as they are not available near them. regarding pricing, here in NYC, ALL ice cream pints run for $5-6, i've seen halo top/enlightened for $8 and people buy it by the case anyway! also, this thing called Wink is big here but i don't put it in the same field, it's like ices in pint form, less ice cream -esque than arctic zero and more like a frozen Ensure(minus the nutrients). @Anon: I want to say Wegman's has a decent sale price on Halo Top to, but I dont remember what it is. @Rabbit: ethyritol, maltitol, chicory root extract, monk fruit extract, & steviol glycosides? Were they aiming to gas up as much of the population as possible? Also, buying groceries in NYC is rough I guess! it makes sense though, there is a huge difference between buying groceries in Boston and buying groceries like an hour west of the city. Back in the day, we would drive about 30 min out of the city to grab groceries just to keep our food budget down. Yep, ShopRite also does B&J Hagen Dazs and Talenti $2.88 pretty regularly. I consume A LOT of Enlightened and Halo Top, Enlightened usually being my brand of choice since I enjoy their flavors a lot more and they use a lot more mix-ins. That being said, I'm excited for more competition. More competition means lower prices usually, who's going to complain about that one? However, I have to say I'm not too thrilled Breyer's chose such limited flavors. Really, they couldn't have released ONE unique flavor that either brand didn't already sell? With so many ice cream flavors they really stayed basic here, at least one fun flavor would have been appreciated! Just purchased the Breyers at my local Jewel was just as expensive as Halo Top. It was on sale for 50 cents off but the regular price is the same....bummer. Halo Top goes on sale at Shop Rite at $2.88 quite often and it's the only time I buy it. Most pints are ok but I've had a few that tasted just way too artificial for me. Same thing with Enlightened. Totally not impressed by how boring these flavors are though, so I have no interest in even trying. Plus there's no fiber, compared to the other two. I haven't tried any of the expensive brand ice creams because they're expensive. After recently becoming diabetic I thought my love affair with ice cream was over. I have tried all the lite and carb smart choices of several brands that make regular ice cream but the aftertaste had me throwing it out. About a month ago I decided to try one more and it was a Meijer's store brand called Purple Cow. Boy oh boy this is one happy and I do mean happy fat girl. The ice cream sandwiches are awesome, and the butter pecan ice cream is good too. Both use Splenda as did some of the others I tried and hated but they do something different because it's really good. Like I always say "if a fat girl won't eat it you know it ain't no damn good". Hope to find some other flavors to try.